We have been using various tweaks to make sandboxed Qt apps well integrated into the system. 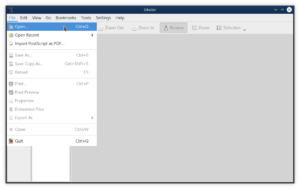 For KDE Plasma integration, we have been allowing access to kdeglobals config file, where we store the most common configuration, like used icon theme, widget style, etc. A similar approach has been used by Gnome, where they need to allow access to DConf, otherwise applications will not be able to read default system configuration. These tweaks have been usually set in the runtimes and applications using these runtimes automatically inherited all the needed permissions during the build. This has some weak spots, because changing permissions in the runtime requires all applications to be rebuild to pick up the changes, or applications not using the runtimes at all had to allow all the access themself and really not everyone knows what everything needs to be enabled. This will change with upcoming release of xdg-desktop-portal (version 1.2), which will bring new portal to solve this problem (for both Flatpak and Snap). There is new “Settings” portal, allowing apps to request various configuration from the sandbox, without need to have access outside (kdeglobals, dconf). 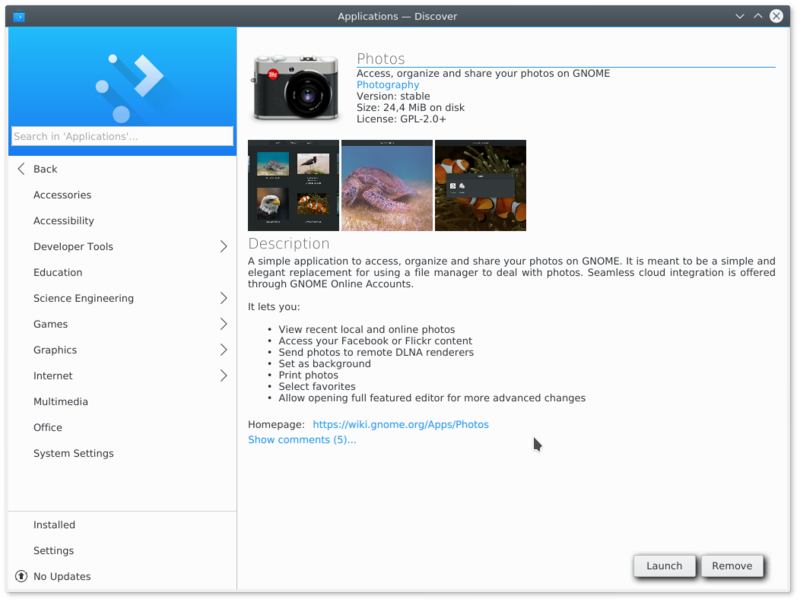 For Gnome configuration, this has been built in directly in xdg-desktop-portal so there is no need for specific backend support. For KDE Plasma configuration, we have our specific code reading kdeglobals config file in xdg-desktop-portal-kde. This support has already been merged and will be part of Plasma 5.15 release in February. To make applications automatically ask for this configuration through the portal, instead of reading kdeglobals/dconf, I added support to both widely used Qt QPA plugins. For applications running under Plasma we have now this implemented in plasma-integration plugin. This support will be also released with Plasma 5.15 in february. For Qt apps running in Gnome, I added this support into QGnomePlatform, which has been released already some time ago and is already available in Flathub. Hopefully with all of this released soon and more widely used, we can slowly start removing all the hardcoded permissions for both dconf and kdeglobals config file in the runtimes. 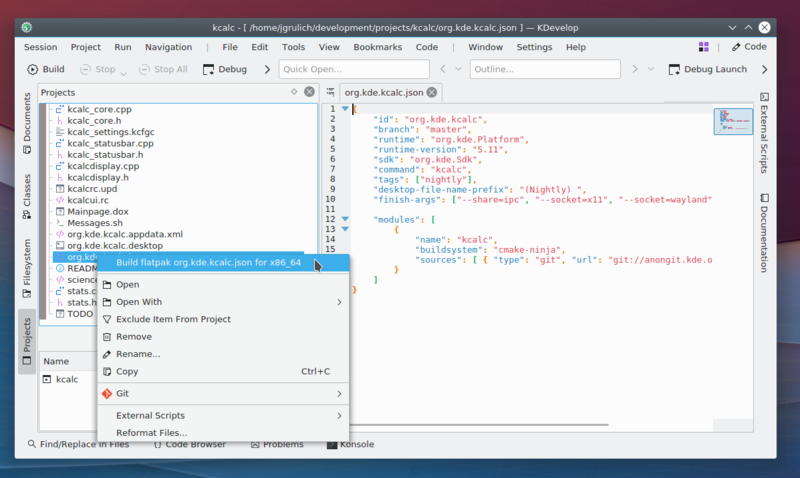 Recently I had a discussion with Carlos Soriano from our Red Hat desktop team about Flatpak support in KDevelop, he was told, when discussing Flatpak support in gnome-builder during KDE Akademy, that we already have support in KDevelop for flatpaks. I told him we really do, but that it’s more in the state of proof of concept and it’s probably not that easy to use it as in gnome-builder. We have this support since KDevelop 5.2, but it never made it to release notes and I guess not many people know about this. I only found some information about it in a blog post from Aleix Pol. I decided to give it a try, I actually already tried it once when I saw that blog post last year, but this time I would like to give a small how to and encourage you to try it and give some feedback to Aleix so we can improve this workflow. This should be something you can build and run in Flatpak, which means usually an application. The easiest way is to open KDevelop, go to Project → Fetch project, and download your favourite application and open it as project. Our plan for future is to distribute flatpak manifests together with applications in their repositories, currently we don’t do that so you have to either write your own, or go to our flatpak-kde-applications repository and get manifest for your application from there. Copy it to the root directory of your project. I think the name of the manifest needs to match your application appstream name, otherwise you will not be able to build it as flatpak. 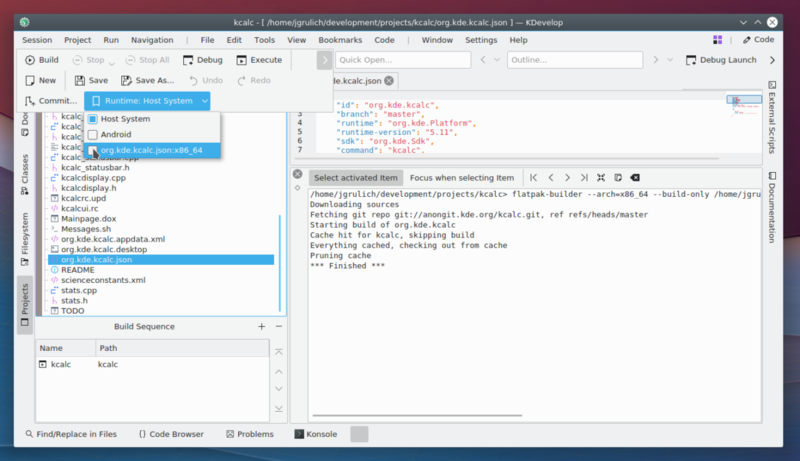 You can now right-click with your mouse on the application manifest and select “Build flatpak org.kde.AppName for x86_64” to build current manifest. I assume you have needed runtime and sdk installed, if not, you can get them from Flathub. If for example you see your app has runtime-version: 5.11 in the manifest, then run flatpak install flathub org.kde.Platform 5.11 and flatpak install flathub org.kde.Sdk 5.11. This will build the app as specified in the manifest, still your modifications, if you made any to the application, will not be applied yet. If you built your application successfuly in the previous step, you can now switch the app to be build under Flatpak runtime. This is either in the menu under Run → Runtime or it should be also accessible from the toolbar. If you switch to Flatpak runtime, you will get a dialog to configure a build directory. Select a different build directory, for example to $HOME/path/to/project/build-flatpak and set installation prefix to /app, which is where applications are installed under flatpak. If you now click to build your application, you will see it runs flatpak build command to build your application. To launch it, you need to configure a launcher to use binaries from build-flatpak folder. If you are in the flatpak runtime, then it will automatically start your application with flatpak run command. You might be asking why anything like this is useful or why such integration has been made. There are few reasons for that. Reproducible builds: this means that if you build your app + your change for example with KDE Runtime based on Qt 5.11, anyone else will be able to build it against same runtime and your new feature or fix should behave identicaly. Usage of different libraries: you might be running latest Qt, but someone reports you that your application is crashing using older version of Qt. You definitely don’t want to build older Qt and install it to a prefix and make your application use it, just to fix a bug you cannot reproduce. With this KDevelop integration, it’s just a matter of changing runtime version in the application manifest. Easy installation of build environment: for people who are new to all of this, it is definitely easier to install everything with just one basic flatpak command. You need to usually just run flatpak install flathub org.kde. [Platform, Sdk] 5.11. This will install everything you need to build every KDE application and you don’t need to mess with your system libraries. 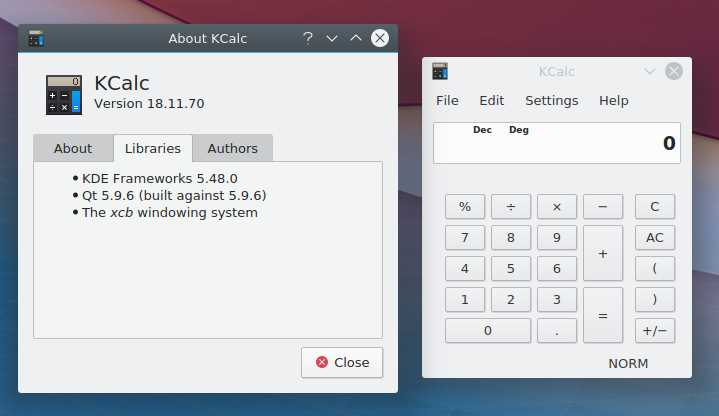 This is kcalc running on KDE Runtime 5.9, while my system is on Qt 5.11.1. If you try this and have some suggestions for improvements, please share them with Aleix Pol, this is in my opinion something worth improving and helpful for beginners. You can also consider improving it yourself, you should be even able to do that from KDevelop running in flatpak, as flatpak can also run flatpaks inside. Like many people around, I plan to attend Akademy this year. I unfortunately was not able to attend it last year, when it was in Spain again and damn, I love Spain, but this time I cannot miss it, especially when it’s so closed to Czech Republic. I’ll be there from the very first day until Thursday 16th of August. We will be organizing a BoF focused on Flatpak and Snap on Tuesday 14th of August in the morning so if you want to discuss or help with anything Flatpak and Snap related then you are more than welcomed. You can also reach me anytime during the conference if you want to discuss something about other stuff I’ve been doing, like plasma-nm or lately screen sharing through PipeWire. See you in Vienna. Two days ago I wrote about our work on screen sharing in web browsers. While there was a lot of work done recently on this area, it’s not still in the state where everything would just work out of the box. There are few steps necessary to make this work for you and here is a brief summary what you need. This is not a distro specific how to, but given I use Fedora 28 and I know that everything you need is there, it’s most likely you will need to figure out the differences for your distribution or build it yourself. PipeWire is the core technology used behind all of this. In Fedora you just need to install it, it’s available for Fedora 27 and newer. Once PipeWire is installed, you can just start it using “pipewire” command. If you want to see what’s going on, you can use “PIPEWIRE_DEBUG=4 pipewire” to start PipeWire with debug information. For Fedora 29, there is a feature planned for PipeWire which should make it to start automatically. 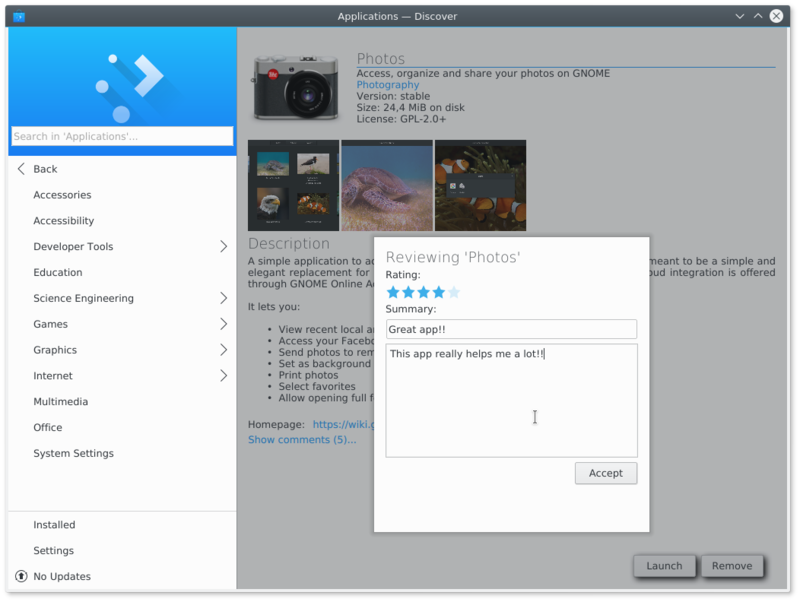 We use xdg-desktop-portal (+ backend implementation) for communication between the app requesting to share a screen and between desktop (Plasma or Gnome). You need xdg-desktop-portal, which is the middle man between the app and backend implementation, compiled with screencast portal. This portal will be build automatically when PipeWire is present during the build. In Fedora you should be already covered when you install it. For backend implementation, if you are using Plasma, you need xdg-desktop-portal-kde from Plasma 5.13.x, again compiled with screencast portal, which is build when PipeWire is present. For Fedora 28+, you can use this COPR repository and you are ready to go. I highly recommend using Plasma 5.13.2, where I have some minor fixes and if you have a chance, try to compile upcoming 5.13.3 version from git (Plasma/5.13 branch), as I rewrote how we connect to PipeWire. Previously our portal implementation worked only when PipeWire was started first, now it shouldn’t matter. If you use Gnome, you can just install xdg-desktop-portal-gtk from Fedora repository or build it yourself. You again need to build screencast portal. Both Plasma and Gnome need some adjustments to enable screen sharing, as in both cases it’s an experimental feature. For Gnome you can follow this guide, just enable screen-cast feature using gsettings. For Plasma, you need to get KWin from Plasma 5.13.x, which is available for Fedora in the COPR repository mentioned above. Then you need to set and export KWIN_REMOTE=1 env variable before KWin starts. There is also one more thing needed for Gnome at this moment, you need to backport this patch to Mutter, otherwise it won’t be able to match PipeWire stream configuration with the app using different framerate, e.g. when using Firefox. Edit: It seems that exporting KWIN_REMOTE=1 is not necessary, it probably was only during the time when this feature was not merged yet. Now it should work without it. You still need KWin from Plasma 5.13. 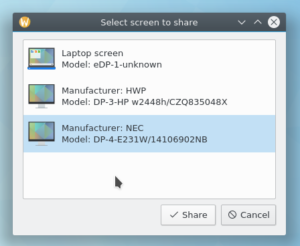 Now you should be all set and ready to share a screen on Gnome/Plasma Wayland session. You can now try Firefox for Fedora 28 or Rawhide from this COPR repository. For Firefox there is a WebRTC test page, where you can test this screen share functionality. Another option is to use my test application for Flatpak portals or use gnome-remote-desktop app. Edit: I didn’t realize that not everyone knows about xdg-desktop-portal or PipeWire, below are some links where you can get an idea what is everything about. I should also mention that while xdg-desktop-portals is primarily designed for flatpak, its usage has been expanded over time as it perfectly makes sense to use it for e.g. Wayland, where like in sandbox, where apps don’t have access to your system, on Wayland apps don’t know about other apps or windows and communication can by done only through compositor. Last time I wrote about possibility to share a screen of Plasma wayland session, using xdg-desktop-portal and our xdg-desktop-portal-kde backend implementation. Problem was that during that time, there was no application which would implement support for this, leaving my previous effort useless so far. Luckily, this should change pretty soon. I, together with my Red Hat collegues Tomáš Popela and Eike Rathke, have been working for past few weeks on bringing support for screen sharing on Wayland to web browsers. All modern browsers use WebRTC for all audio-video communication, including screen sharing, meaning that in a perfect world, just one implementation would be needed, which is not that exactly this case. Let’s go a bit into the details first. Each system (Windows, Mac and X11) in WebRTC reimplements an abstract class called DesktopCapturer, which defines API used by applications to support screen sharing. For our wayland support, we started with a new implementation using Pipewire as the core technology used for screen content delivery and for the communication part, to request which screen to share and to obtain Pipewire stream information, we use xdg-desktop-portal, providing simple API to do so. Advantage of using xdg-desktop-portal is that it will work also in sandbox (Flatpak and Snap) and that there is support in Plasma (using xdg-desktop-portal-kde backend) and support for Gnome (using xdg-desktop-portal-gtk backend), both using same API. Using our desktop capturer implementation, WebRTC starts to communicate with xdg-desktop-portal, we set up a session associated with our request, we tell xdg-desktop-portal that we have interest in screen sharing so xdg-desktop-portals asks your backend implementation to provide a dialog to select a screen to share and once this is settled, we request to start screen sharing and backend implementation will set up Pipewire stream, sending us back file descriptor of a Pipewire remote which we can open and connect to it. Once we are connected, we finally start receiving buffers from Pipewire with screen data and providing them to applications. This so far sounds simple and that the work is basically done, but this is unfortunately not an ideal world. We found out that e.g. Firefox uses some older copy of WebRTC, so while working on WebRTC trunk, to have our work ready for upstream, we had to modify slightly our changes for Firefox older copy in order to be able to test our changes. There is also one thing we haven’t figured out yet, the thing is that Firefox has its own dialog to select a screen (for other capturer implementations) and we were not able to avoid displaying it when our capturer is used. Another thing is Chromium, which seems to be using WebRTC in a different way when compared to Firefox as Chromium is using plugins so this is also something we have to figure out. There are probably still plenty of other things to do before all of this can be upstream, but we have made great progress on this so far. We even had couple of Bluejeans calls where both sides could share their screens, one running Gnome Wayland session and me running Plasma Wayland session. And for those who like adventures, I have set up a Fedora COPR repository (currently building), with Firefox containing our changes so you can test it yourself, we will need testers soon or later anyway. You just need to make sure that Pipewire is running, otherwise this won’t work, portals (both xdg-desktop-portal and backend implementation) should be started automatically. One of the important missing features in Plasma wayland session is without a doubt possibility to share your screen or record you screen. To support this you need help of the compositor and somehow deliver all needed information to the client (application), in ideal way something what can be used by all DEs, such as Gnome. Luckily, this has been one of the primary goals of Pipewire, together with support for Flatpak. If you haven’t heard about Pipewire, it’s a new project that wants to improve audio and video handling in Linux, supporting all the usecases handled by PulseAudio and providing same level of handling for video input and output. With Pipewire supporting this, there was recently a new API added to xdg-desktop-portal for screen cast support and also for remote desktop. Using this API, applications can now have access to your screen content on Wayland sessions or in case they are running in sandbox. With various backend implementation, like xdg-desktop-portal-kde or xdg-desktop-portal-gtk, they just need to support one API to target all desktops. Screen cast portal works the way, that the client first needs to create a session between him and xdp (xdg-desktop-portal) backend implementation, user then gets a dialog with a screen he would like to share and starts screen sharing. Once he does that, xdp backend implementation creates a Pipewire stream, sends back response to the client with stream id and then client can connect to that stream and get its content. Once he no longer requests content of the selected stream, xdp backend implementation gets information that nobody is longer connected to the created Pipewire stream and can stop sharing screen information and xdp backend implementation is again ready to accept next requests for screen sharing. This is all happening in the background so there is really no cool picture I can show, at least this dialog which you get when you request to share a screen. I finished support for screen cast portal in xdg-desktop-portal-kde last week and currently waiting for it to pass review and be merged to master. This is also currently blocked by two not merged reviews, one adding support for sending GBM buffers from KWin and one with new Remote Access Manager interface in KWayland, both authored by Oleg Chernovskiy, for which I’m really greatful. This all will hopefully land soon enough for Plasma 5.13. Testing this is currently a bit complicated as you need everything compiled yourself and besides my testing application there is really no app using this, except maybe Gnome remote desktop, but there should be support in future for this in Krfb, Chrome or in Firefox. Hopefully soon enough. Last thing I would like to mention is for GSoC students. We also need remote desktop portal support to have full remote desktop experience so I decided to propose this as a GSoC idea so students can choose this interesting stuff as their GSoC work. Your Qt apps running in flatpak should then automatically pick up all of these extensions without any further modification, same way it does automatically when you run it outside the sandbox. Simply done!. I’m also aware that there are more Gtk themes, like adwaita-dark or high-contrast, both are also available in form of Qt style and we will probably package them later, but at this point it is mostly proof of concept that this can be done and works nicely. You can follow our wiki page if you want more information about runtimes, repository with applications and so on and from me it’s all for now. Btw. below you can see okular running in flatpak and using adwaita-qt style with adwaita icons. I have been working lately on fixing issues we had with telegram when using Qt’s flatpak platform plugin to have portals support. This was all crashing due to system tray. Qt tries to fallback to xembed when platform theme doesn’t provide any system tray implementation. Unfortunately Qt assumes that we are using xcb platform plugin (used everywhere by default) and tried to call some functions on it, but unfortunately we were using flatpak platform plugin which loads xcb only internally and because of that it was crashing. To solve that I had to implement my own xembed support into our flatpak platform plugin without using xcb specific functions. This was all happening only on Gnome, because in KDE our platform theme has it’s own implementation of system tray using SNI and xembed is not used there at all. With all those fixes I decided to make telegram to finally use flatpak platform plugin by default. What is also new is that I created one more branch with alpha releases. Right now I have master branch with latest stable telegram in version 1.0.29 and devel branch with latest alpha release 1.0.37 bringing support for calling. You can get it the same way as before, following instructions from previous blog post, except that now you have to specify branch you want to install. 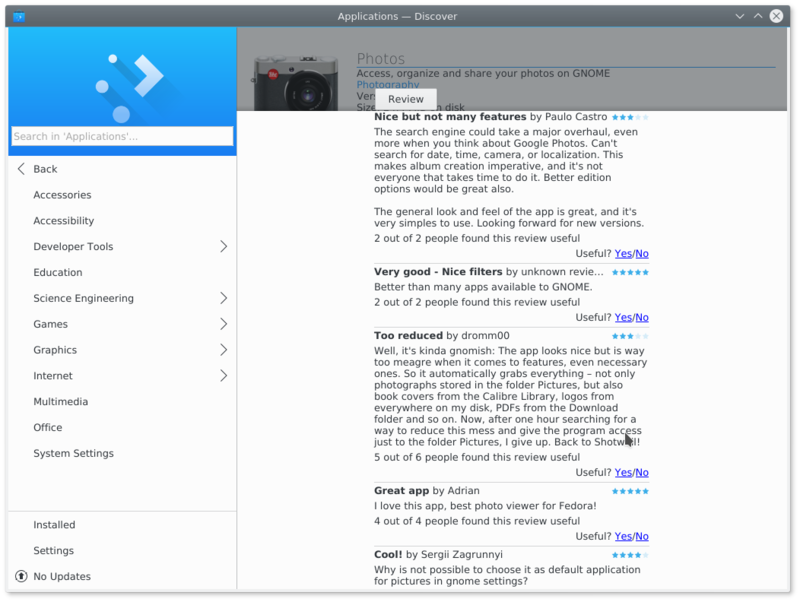 As I’m trying to keep improving the flatpak backend in discover I decided to add support for reviews. 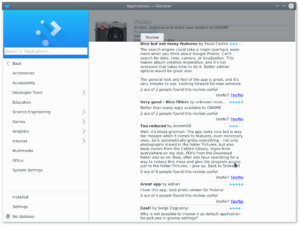 To do so I implemented support for GNOME’s Open Desktop Ratings which is rating/review system used by gnome-software. Result of this is now fully functional review system, where you can read user comments and ratings and submit your own reviews. We also use same mechanism as in gnome-software for generating user_hash which identifies you in odrs server and given that you are able to modify/delete your reviews from both discover and gnome-software (note that discover doesn’t support this yet). You can also vote for already existing reviews so others get feedback on how useful each review is. We also decided to use same review system in our PackageKit backend and replace current Ubuntu Popularity Contest system so not only flatpak users will benefit from this. During testing of this review support we’ve hit many UI issues related to review system causing users not to be able see reviews or write new ones which were introduced during transition to kirigami. We fixed all of them and you can look forward to improved experience in the upcoming discover release. To improve this further, we or at least I, would like to also add a new widget showing current total app ratings as of now you can only see reviews with comments only, not overall app rating, but this needs some discussion and design consideration. If you want to test it, which we would like you to do, you can just compile discover from master branch (with -DBUILD_FlatpakBackend=ON cmake parameter for flatpak support). That’s all from me for now. Have a nice weekend :). The reason I did the hard work to build it with Qt from KDE runtimes is that now you can use telegram with portals support if you run it with “-platform flatpak” parameter. Unfortunately this only makes openURI portal to work as telegram has some internal hacks or whatever to use gtk filedialog so for that reason I still allow to access user’s home directory. There is also a bug if you use telegram under KDE where it tries to use QSystemTrayIcon instead of libappindicator and unfortunately telegram’s system tray icon (the one using QSystemTrayIcon) works only with Qt 5.6.2 and in KDE runtimes we have Qt 5.7.1. The system tray icon is visible, but its context menu doesn’t work so if you want to have fully working system tray icon you have to use “–env=XDG_CURRENT_DESKTOP=gnome” flatpak parameter to force it to use libappindicator. And that’s it. Sorry you had telegram broken for couple of days while I was fighting with it, but hopefully it will work perfectly now. Copyright © 2019 Jan Grulich. All rights reserved.